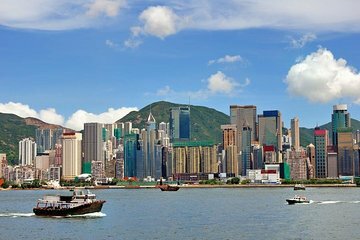 Save time and headaches with this hassle-free, one-way private Hong Kong cruise port transfer. Your friendly English Speaking tour guide will collect you upon arrival at Ocean Terminal and transport you to Hong Kong or Kowloon hotel in the air-conditioned comfort of your own private vehicle. Pre-book this service, which is available 24 hours a day, seven days a week, to insure the ultimate arrival with ease. Your friendly and professional English Speaking tour guide will meet you upon arrival at Hong Kong’s Ocean Terminal and transport you in the comfort of your own private vehicle to Hong Kong’ or Kowloon hotel. This hassle-free one-way transfer is the easiest way to navigate upon arrival. Have your ship details on hand when booking and be sure to indicate the location of your hotel. You’ll receive confirmation within 24 hours of booking and can present your driver with the travel voucher upon arrival. The Hong Kong terminal is chaos, but shortly after we found the dispatcher with our name on a list we were on our way. Both the dispatcher and the driver double-checked our final destination. I initially had a problem booking this transfer as we arrived at the Kai Tak Terminal not the Ocean Terminal however the amazing team at Tour East had it all sorted by phone and were waiting when we disembarked with 2 vehicles for our party of 6. It is an expensive way to transfer off the ship but taxis are a real problem at times at the terminal and it was well worth the price and it was similar to what the ship was offering in USD- great vehicles , good drivers and I would highly recommend this service. Just be sure to specify which Terminal the ship is disembarking. I use Viator for all my transfers and they havn't let me down yet. Nice clean car and professional driver. Be sure to get the exact location and time for your pickup in advance and everything will be smooth from there on out. person took charge of our luggage. Excellent service with wonderful English speaking guide. Not a good experience, due to the chaos at the terminal, which is attached to a shopping mall. Unable to locate our driver, so managed to get a helpful courier, from another company, to phone for us. There is nowhere for taxi's to park, so they just drive round and round the terminal, stopping for a few minutes each time. Very stressful. Driver was prompt and professional. We are especially grateful to him because our camera was left in the vehicle and he turned around and brought it back to us at the hotel. Excellent for the transfer from the port to the Best Western hotel, however, it was not without some concern. A few days before we docked in HK, we were VERY disappointed to receive an email stating that we DO NOT have a transfer and have to go to the website to place an order, which we were unable to do. We had a paid and written confirmation. We had the concierge on the ship call Viator's representative and they confirmed that we did have a transfer. So, the question is - why did we receive this email saying we do not have a transfer? We also had a paid and written confirmation of a transfer from the Best Western hotel to the airport. HOWEVER, Susan told us that THEY CANNOT HONOR OUR RESERVATION. This was very disappointing!!!! When I inquired as to how we should get to the airport, she suggested that we take a taxi. As it turned out we found out that if we get to IFC building there is an airport train - which we took. If Susan would have shared this information with us, we would have not have been so anxious. Our account was credited for this transfer. When we left our cruise unfortunately all the computers in the Customs department had failed. Two laptops had been brought in to process two shiploads of passengers. This took over 45 minutes. Then, when we went to the transfer area they were only admitting 3 taxis at a time, giving preference to the shuttle buses from the cruises. This forced us to wait another 45 minutes or so. Once our driver arrived we went directly to the hotel without further delay.